Keep your clothes and your car clean. You work hard to maintain your vehicle; you don’t want your clothes to interfere. 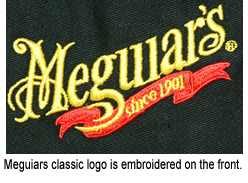 Cover metal buttons and buckles on the front of your clothing with Meguiars Shop Apron. The apron measures 34.5 inches from the top hem to the bottom hem. Its 22.5 inches wide with 31 inch ties.